Back in 2011, Belgravia’s Liz Brooks was on the sales team for a luxury condo project on the Near West Side. The units were sleek and stylish, and the neighborhood was carving out an identity as a destination for those who wanted to be close to everything the downtown area had to offer. For at least one couple who came into the sales office, there was just one problem: The building didn’t exist yet, and the roughly 18-month wait for the finished product felt too long. The couple passed on a three-bedroom, three-bathroom unit, only to return subsequently to look at a similar unit in another Belgravia development in the same neighborhood about five years later. This time they pulled the trigger, shelling out about $850,000 for the unit. But there was a problem with that, too: If they would have made a move in 2011, they could have bought the comparable unit they’d passed on for $489,900. Few could have predicted in 2011 that over the next four years, Google would open a flagship office in the neighborhood, hotels would break ground there for the first time, McDonald’s would build a gleaming new corporate headquarters building in the area and the CTA would open a new elevated train station nearby to meet the surging demand to live, work and play there. 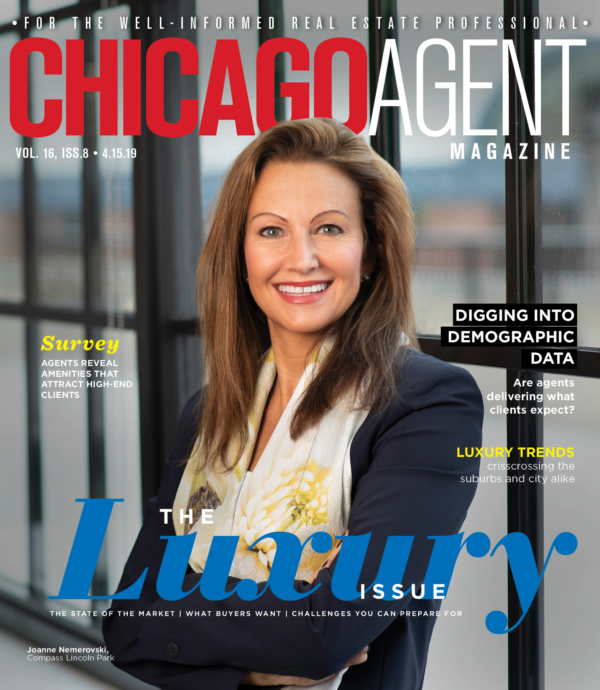 At Chicago Agent magazine’s recent Accelerate summit, Chase Chief Economist Anthony Chan called new-home construction “where the rubber meets the road” — a barometer of the health of the overall housing market, and a key piece of the entire economic jigsaw puzzle. But as anyone who’s ever bought, sold or lived in a new home knows, it’s also so much more than that. The core idea that there’s no better time than now and no better home than new has broad application from the city to the suburbs and from condos to single-family homes. And the ability of builders and agents to confidently demonstrate to buyers that a new home will serve their interests and help them realize their dreams can have an impact that’s greater than any one house, condo or subdivision. But the appliances themselves can also help cut costs. The average American household spends $1,900 a year on energy bills, according to Energy Star. New homes tend to cost far below that average, and when prospective buyers pencil out the math, they often find that even a modest shave of $100 or so off their utility bills over a multi-year mortgage term can alter a monthly budget by enough that it can free up a significant amount of cash to go toward paying off a property. Also helping to keep costs down are construction methods employed by companies that can build at scale. For its homebuilding operations in Chicagoland and nearby markets, Toll Brothers operates a facility in Indiana where entire walls, floors and other large pieces of homes are built indoors, away from the elements. This is cheaper than building each house out of a pile of two-by-fours and plywood dropped off at each homesite, which can help keep costs lower for buyers. The method also allows for more efficiency and precision once a home is put together onsite, since it eliminates the kinds of slight errors that can happen when, for example, framing is done on a rainy day. These kinds of errors can also compromise seals and leave a home less energy efficient. “It’s allowed us to build both better and cheaper than we otherwise could, and the cost savings are reflected in where we’re able to set our pricing for buyers,” Martin said. Some decisions related to buying a home are viewed as matters of necessity: Bedroom count, school district, price range. But for some buyers, the necessity boxes are all checked and the process is more about getting something tailored to one’s tastes and sensibilities. Some of the feedback Jawdat incorporates into her newly-built homes is gathered from numerous clients and synthesized as offerings available in subsequent homes. But some clients have asked for specific features that are rarely found in existing homes — such as laundry rooms on the second floor, master bedrooms on the first floor accompanied by a walk-out basement or even a sauna. Jawdat, who is a practicing real estate agent with Baird & Warner in addition to a being a developer, looks at building the way an agent might look at selling. As an advisor, she is there to help a client get to their goal, even if it means one less contract signed in the short term. One recent client wanted a set of elements in their new home that she wasn’t able to deliver in a timely way, so rather than try to convince the buyer to go with something that didn’t fit their requests, Jawdat referred them to another custom homebuilder who was in a better position to realize that client’s vision. Jawdat has built about 60 ground-up homes through her development company, Sawsan Lux Homes, which is most active in the South Side neighborhood of Bronzeville. Looking ahead, she said she’d like to build an entire subdivision when the right opportunity comes along. In real estate, sometimes you’ll hear a phrase that’s been attributed to Mark Twain: “Buy land; they’re not making any more of it.” Today, that wisdom might be adapted to: “Buy now; land’s not getting any cheaper.” Rising parcel prices, along with the increasing cost of materials and labor, have made Chicago’s core downtown submarkets harder for buyers at mid-level price points to afford. One reason for the high land pricing is that condo developers are competing with rental developers for labor and land in a market that has favored apartment projects for the past several years. It’s a trend that shows no signs of reversing, and the added cost is ultimately passed on to buyers. Belgravia is in the marketing phase of a condo development called Triangle Square, located on a triangular lot near the corner of Webster and Elston Avenues on the eastern end of Bucktown. According to Brooks, pricing on the development’s 66 units will average around $450 per square foot — meaning the units will be affordable to a much wider swath of buyers than most of what’s being built in the other core neighborhoods of the city, including Bucktown itself. On Collaborative, which is a full-service development sales and marketing firm integrated within Coldwell Banker, also recently announced a condo development to be built by JK Equities on the Near West Side, at 1400 West Monroe. Wolf said units will be priced well below the $700-per-square-foot threshold as sales kick off. The project is in the same neighborhood where that couple who hesitated several years before buying ended up paying nearly double what they could have for a unit in a Belgravia building. Whether price appreciation that rapid is still possible is something no one can know. But Belgravia’s Brooks is pretty sure of one thing.